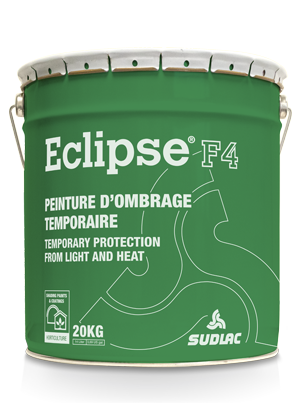 Eclipse® F2/F4/F6 paints, Sudlac’s historical range and the result of years of development and optimization, are three shading paints for greenhouses, tunnels, and shelters, offering the same level of protection but for different lengths of time. This allows growers to select the protection time that best meets their needs without having to remove the paint. Our F2/F4/F6 paints are designed to provide effective, reliable shading protection during the first few weeks after application, gradually wearing off over the season as required. Under identical dilution and application conditions, each of the Eclipse F-series paints produces the same results in terms of the shading rate, but offers a different protection time. The higher the number following the F, the longer the protection will last. The shade layer reduces direct solar radiation, resulting in less stress, and protects the crops from sunburn, which improves yield and quality. In countries with a temperate climate, the Eclipse F-series is mainly used to protect ornamentals and leafy vegetables in greenhouses. In the warmer areas of the world, it is also used for fruit vegetables such as tomatoes and sweet peppers. Eclipse F2/F4/F6 paints need to be diluted with clean water before being sprayed onto the greenhouse. Depending on the application method, type of greenhouse, and climate, the dilution rate and amount of spraying liquid may vary to achieve the best result. The product can be applied manually, by machine, and by helicopter, and is compatible with all greenhouse surfaces. In order to allow users to deal with any unforeseen circumstances, Eclipse F-series paints can be removed with Eclipse NET cleaner. *Eclipse F2 bucket contains 15kg.